The Chaplet of Mercy is recited using ordinary rosary beads of five decades. The Chaplet is preceded by two optional opening prayers from the Diary of Saint Faustina and followed by an optional closing prayer. I believe in God, the Father Almighty, Creator of Heaven and earth; and in Jesus Christ, His only Son, Our Lord, Who was conceived by the Holy Ghost, born of the Virgin Mary, suffered under Pontius Pilate, was crucified; died, and was buried. He descended into Hell; the third day He arose again from the dead; He ascended into Heaven, sitteth at the right hand of God, the Father Almighty; from thence He shall come to judge the living and the dead. I believe in the Holy Spirit, the holy Catholic Church, the communion of saints, the forgiveness of sins, the resurrection of the body, and the life everlasting. Amen. 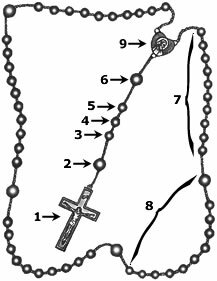 Saying the “Eternal Father” (6) on the “Our Father” bead and then 10 “For the sake of His sorrowful Passion” (7) on the following “Hail Mary” beads. As she continued saying this inspired prayer, the angel became helpless and could not carry out the deserved punishment (see 474). The next day, as she was entering the chapel, she again heard this interior voice, instructing her how to recite the prayer that our Lord later called “the Chaplet.” This time, after “have mercy on us” were added the words “and on the whole world” (476). From then on, she recited this form of prayer almost constantly, offering it especially for the dying. In subsequent revelations, the Lord made it clear that the Chaplet was not just for her, but for the whole world. He also attached extraordinary promises to its recitation. It is likewise appropriate to pray the Chaplet during the “Hour of Great Mercy” — three o’clock each afternoon (recalling the time of Christ’s death on the cross). In His revelations to St. Faustina, Our Lord asked for a special remembrance of His Passion at that hour.